Outfit7 Limited has relaunched its Talking Tom Cat mobile app, updating Tom’s look and providing new safety features for child users. Outfit7 Limited has relaunched its Talking Tom Cat mobile app, updating Tom’s look and providing new safety features for child users. The Talking Tom Cat app allows users to speak into their device to hear Tom repeat their words in a funny voice. With this update, Tom has been given an updated 3-D look, as well as over a dozen new animations. These animations include reactions to eating new foods such as hot chili peppers and ice cream. In addition, Outfit7 has made the experience more child-friendly by adding a Child Mode to the app. When this mode is active, the app turns off banner ads and interstitials, so kids can’t be sent out of the app by tapping an ad. In addition, users are not presented with paywalls when Child Mode is active. Talking Tom Cat put Outfit7 on the map, making us who we are today. The app has, and continues to embody our company’s youthful enthusiasm. We are confident that long-time fans and new players alike will delight in Tom’s latest features while continuing to savor the pure, instant fun from Talking Tom Cat. 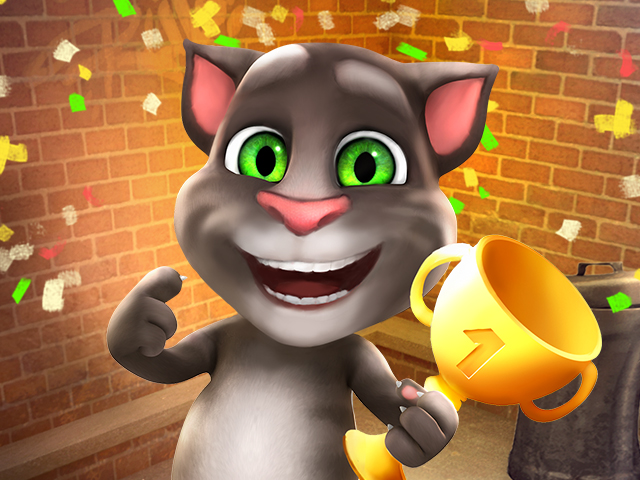 Apps in the Talking Tom and Friends franchise have been downloaded more than 3.6 billion times. In the past six years, users have spent 945,000 years playing in Talking Tom apps, and have knocked him down over 191 billion times. The Talking Tom Cat app is available to download for free on the iTunes App Store, Google Play, Windows Store and Amazon Appstore.